Every GlassParency automotive application is backed by a three year product warranty. This warranty ensures that the product will perform at its peak level as long as the glass is properly maintained. The maintenance process is simple and is recommend to be done at least 3 to 4 times a year along with our other maintenance services. Our two-step professionally installed glass coating application creates a barrier to repel water, snow, ice, dust, oil, and dirt creating a resistant and easy to clean surface. Some of the major benefits include enhanced optical clarity, better driver vision, safety for the driver and all passengers, a reduction in day and night glare, and a more aesthetically appealing look to your vehicle glass. Unlike many wax-based or topical coatings, GlassParency is a chemically engineered glass coating to react to silica within the glass, creating a bond unmatched by other glass coating products. It’s product attributes go beyond just a water repellency, making it ideal in any climate or environment. Unlike many other products on the market it is not a wax or topical treatment. It is a long term solution for perfecting your glass. Living in a drier or even desert climate, you may not always experience consistent rainstorms. 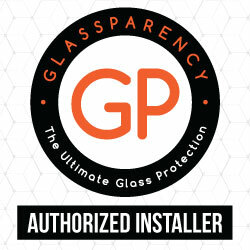 This is where GlassParency proves itself to be more than just another water repellency glass coating. GlassParency will make your glass easier to clean and maintain, keeping dirt and dust build up from caking on your vehicles glass. By sealing the glass, hard mineral water spots will be easier to remove and staining will be less likely to occur. Ice, snow, rain and sleet will repel off of your vehicles glass while driving in harsh winter weather. Seeing clearer can make all of the difference when driving in these dangerous conditions. By treating your vehicle, ice will have a more difficult time gripping in the natural pores of your glass making removal a breeze. A glass coating treated windshield will also benefit from faster defrosting times. Water micro-beads and sheets off while you are driving, making it a safer experience for both you and your passengers. Night glare will also be significantly reduced, improving your visibility and reaction time. Prior to the application, your vehicle’s glass will under go a decontaminating and cleansing process. The releasing agents in the cleansing chemical will ensure that the pores of the glass are contaminant free to improve the bonding process. After the cleansing process, Chemical A is applied to the glass. Chemical A reacts to silica, growing a substrate within the pores of the glass. Next is Chemical B. Chemical B reacts directly to Chemical A, forming an ultra-hydrophobic barrier. In harsh winter months, snow and sleet will repel and ice will become easier to remove, cutting down defrosting time. Bugs, dirt, mud and hard water stains will have a hard time sticking to treated glass, making them simply wash away.